Several years ago we received a letter from someone with the same surname that lived on the south coast, asking if we had any information on the family. At the time we knew nothing about the family. My father had died young and both his parents were dead. We had lost touch with other family members and so it came to pass that we embarked on a quest for our own holy grail, my family’s history. Our family name seems to have originated in darkest Staffordshire, around the village of Fulford. It seems we were farmers and records show there is still a “Batkin field” in the area. Like most families we were deeply affected by the industrial revolution and as farm machinery made farming less labour intensive, the family migrated to pastures new. The natural path was to the growing industrialised centres such as Stafford, Birmingham and of course Wolverhampton. The family moved into the growing service industries such as inn keeping, hairdressing and other trades such as house painting. The natural progression from keeping local inns in Stafford and surrounding areas was to spread further a field. This was easily achieved following the coming of the railways in the 1830’s. We spread as far as Liverpool and Yorkshire. From Liverpool we spread even further, across the pond to America. An ancestor lied about his age and set sail for New Orleans before moving on to Texas and finally settling the family in Indiana. Last year, 2005, we visited our cousins over there at a Batkin reunion and following my retirement this year, we plan to move over there. 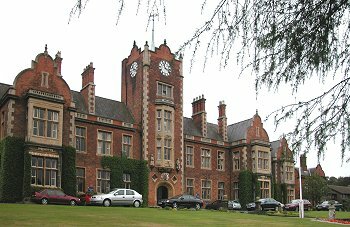 The Royal School, Wolverhampton. Others in the family have not been so lucky. There is a recorded story where an ancestor farmed land with his wife and children. When the father died his wife tried to carry on but found it increasingly difficult to feed her kids. In desperation she gave one of her children, her eldest daughter, to the orphanage asylum in Wolverhampton. Now at this point we were very lucky as the building changed usage and became the Royal school on the Penn road. They had kept all the asylum records and after a search found our ancestor. In return for her board and keep, she agreed to learn how to be a domestic servant, a trade which she could use on leaving the asylum. In another recorded case, a family member was charged by Birmingham assizes in the 1830’s with stealing “two hams and a ladies cloak”. It seems he needed the food so he stole it wrapping it in the ladies cloak. He was given the choice of death by hanging or transportation to Australia. It seems he served his time, married and we now have quite a few relatives over in New South Wales. Via various routes we are also now in New Zealand and Canada. One ancestor was quite a well to do person. He owned several pubs, a wine importing business, had a bottling plant and was agent for Bass, Guinness and Vimto, as well as for a firm of crisps makers. He was married three times, was a mason, a championship level clay pigeon shooter and a big wig in the local tory party. In some ways he is a hero although in others not so. My wife, Sue has done some Stirling work on the family both here and abroad. Whereas I once believed we were the last of a few, we now know we are not only all across the UK but the world. In the Wolverhampton area my great grandfather ran several pubs. He started at the Viaduct in Horseley fields, then the Red Lion, around the corner, before moving to the Swan at Tettenhall and then onto the Fieldhouse, now known as the Claregate, a pub built on the site of the original. The last move we have is from here to the Royal Oak in Tettenhall wood. It was here that my father was born. Shortly after he was born, he contracted TB and the family were advised to move to the more efficacious air of Penn. The rest, as they say, is history. In conclusion, our family has seen it all. We were about during the Spanish Armada, the civil war, the plague, the great fire of London. We may not have played much part in these events although it is difficult to see how we could not be affected by such. Even in my lifetime we have stories of a family divided by religion, passing on opposite sides of the street, something I find almost inconceivable. Most of my family have been ordinary working people although one or two have made it to great heights within their communities. We have survived everything that man and nature can throw at us and yet we are still here and growing. This is something to be proud of I think.